The Adarna guitarist Andrea Jasek, bassist Ray Cheng and vocalist/guitarist William Moore finish up their set Sunday night at Why Sound. The Adarna were ready to wrap up a nine-song set at Why Sound Sunday night when frontman William Moore pointed at a rabid fan in the audience and asked a rather unusual question. Now, if there was anyone at the concert who wasn’t familiar with the classic “More Cowbell” sketch from “Saturday Night Live” that spoof’s Blue Oyster Cult’s recording of “(Don’t Fear) The Reaper,” they would have definitely been confused by Moore’s query. It also helped to know that The Adarna’s biggest hit, “Sugar,” prominently features the sounds of a cowbell, played by the band’s drummer, Murdock, rather than a separate Gene Frenkle/Will Ferrell-like individual. With sweat just pouring off of him, the ultra-active Moore looked like he was suffering from a serious fever himself as he geared up to deliver “Sugar.” But the lead vocalist of the Seattle-based band still had more than enough energy left to belt out one of the songs that has helped get The Adarna’s music played on MTV, Myx TV, M&L TV and more than 200 media outlets and radio stations worldwide. Although he boasts no discernible accent, Moore originally hails from the United Kingdom. The self-proclaimed “military brat” is of Filipino-Scottish descent, which is how The Adarna came to get its name. The Adarna is a phoenix-like songbird described in a Filipino folk tale, and the band is what emerged when Moore joined forces with Seattle guitarist Andrea Jasek. The twosome, who were previously in a band together called Veritas, formed The Adarna a little over three years ago. 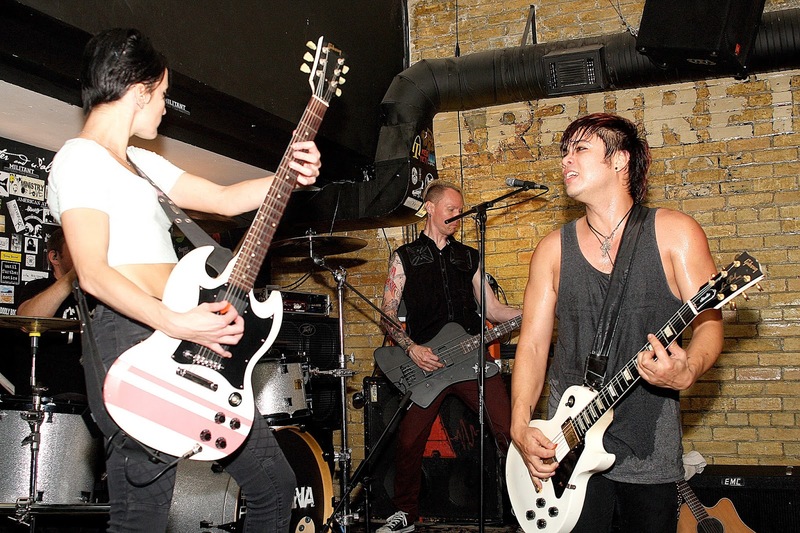 The original drummer was soon replaced by a jazz and metal skinsman from Rochester, N.Y., known only as Murdock, while current bassist Raymond Cheng, a Baltimore native, is a recent addition to the group. “Veritas was my first band, and I loved it,” Moore says. “But we did absolutely squat. I think I must have played 400 shows, and I have nothing to show for it — not even a record or anybody that remembers me. But I learned how to tour, and I learned what I liked about it and what I hated about management and being controlled. 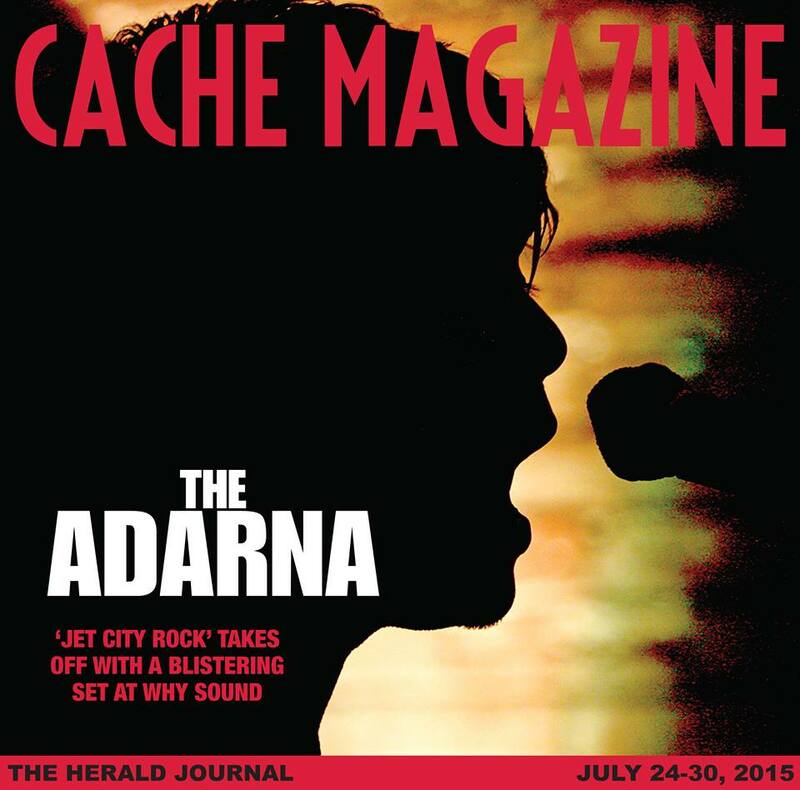 The Adarna released a self-titled EP in 2012 that features five songs, including the band’s debut single, “Honestly.” That song and its corresponding video helped get The Adarna some attention and a lot of airplay, particularly in the Pacific Northwest. That success has led to several tours around North America, and the band has been averaging about 80 to 120 shows per year. Sunday night’s visit to Why Sound was the fourth of Moore’s career — “I love it here!” he declares. “If 10 people show up, it’s awesome! It’s like, ‘Yes!’” — and came in the middle of The Adarna’s two-month tour in support of the group’s second album, “How Perceptive.” That CD features “Sugar” and “Superman,” two more songs that have received significant airplay and are backed up by well-produced videos. Murdock, who grew up a huge fan of “The A-Team,” received his moniker while playing with a band back in Rochester. Known for his mechanical abilities, he gladly assumed the identity of the character played by Dwight Schultz in the popular ’80s TV series. Thanks to Murdock, who also owns his own tech company in Seattle, The Adarna actually have the luxury of traveling in a custom-designed bus known as Wendy. Formerly a 20-passenger school bus, Wendy was redesigned to accommodate all of the band’s gear along with room for a bed, a couch, a large table and a refrigerator. “Wendy’s kind of our prized jewel,” Moore says. After playing venues in the Western U.S., The Adarna are heading back to the Midwest and the East Coast to play some gigs in the early fall. Then around Christmastime, the band will go on a much more extensive tour; the group is slated to perform for American military forces throughout the Middle East in December and January. “I’m very late into music,” Moore says. “I was in between plays in L.A. pursuing the Hollywood dream, when a friend of mine said he’d show me a couple of chords. So, I started doing that. At the same time, I was there on the ground level where you could consider it, making it. I mean, I was there next to Brad Pitt and Angelina Jolie. Although everyone but Jasek come from outside of the Pacific Northwest, the group is clearly proud of Seattle’s rock heritage that includes Jimi Hendrix, Heart and Queensryche, as well as the grunge-era heavyweights such as Nirvana, Pearl Jam, Alice in Chains and Soundgarden. “There are fantastic musicians in Seattle,” Moore declares. “We know pretty much every rock band that’s in Seattle right now, and it’s very much a community. It’s not the same scene it was back in the ’90s, but it’s a scene, nonetheless.